The No. 2 ranked University of Denver Pioneers (3-0) host The Ohio State University Buckeyes from the CCHA(1-2-1) during Homecoming and University of Denver Hall of Fame Weekend. Sellout crowds are expected. The Pioneers are 4-2 all-time, including a 3-2 mark in Denver, against Ohio State in the series that started in 1973. When the Pioneers and Buckeyes met last time on Oct. 3, 2003, DU thumped OSU 5-2 at the Lefty McFadden Invitational tournament in Dayton to open the season, with the Pioneers going on to win the NCAA Championship. The Pioneers have scored five or more goals in their last three meetings against Ohio State and have outscored the Buckeyes, 32-21, in six meetings. 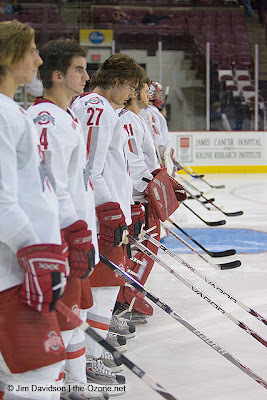 The ‘Puck Bucks’, a very young OSU team with 22 underclassmen, improved to 1-2-1 after splitting a two-game series against Lake Superior State last weekend in Columbus. Lake State defeated OSU 7-3 on Oct. 17, but the Buckeyes earned the split with a 4-2 win on Oct. 18. The Buckeyes opened the season with a loss (7-3) and tie (3-3) against in state rival Miami (Ohio). Sophomore forward John Albert leads the team in scoring with 2-4—6, Sophomore Hunter Bishop has 5 poitns and rookie phenom Zac Dalpe, who played in juniors in Wayne Gretzky’s hometown of Brantford, Ont., earned CCHA Rookie of the Week honors after a four-point weekend against the Lakers. Goalies Joseph Palmer (0-2-1, 5.36 GAA, .836 Sv%) and Dustin Carlson (1-0, 4.01 GAA, .854 Sv%) have each played three games, and both have struggled. OSU is 3-for-24 (12.5%) on the power play and 20-for-28 (71.4%) on the penalty kill. Head coach John Markell is 243-236-47 in 15 seasons at Ohio State. Ohio State first laced up the varsity skates in 1963 in the what is now the old OSU Ice Rink, which is connected to St. John's Arena (the former basketball home of the Buckeyes), and a stone’s throw from the famous “Horseshoe” of Ohio Stadium. The OSU ice rink was notoriously grim from the very beginning seating about 1,000 people on bleachers with a low ceiling, with additional standing room for another 200 people. The men’s played in the OSU Ice Rink from 1963 until 1998, when they moved in to the Value City Arena at the Jerome Scottenstein Center, the 17,500 seat home of OSU Hockey and Basketball and the largest hockey arena in the NCAA today. Poineer fans behold the Value City Arena with great reverance, as it was site of the 2005 NCAA Denver title in Columbus. The old OSU rink is now home to the OSU women’s hockey team. OSU began hockey in 1963 as part of the now defunct Midwest Collegiate Hockey Association under former Colorado College coach Tom Bedecki, who had won CC’s last NCAA Championship in 1957 as coach of the Tigers. After a couple of losing seasons, Bedecki was replaced by Glen Sonmor, who coached only a year at OSU before moving on the coach the Minnesota Gophers. Current Toronto Maple Leafs TV analyst Harry Neale took over the reins for the next four seasons and coached OSU from 1966-70. “We only had four scholarships, which we wound up splitting between eight kids” Neale told the Toronto Sun in 2006 …We didn’t win many games, but I helped (Buckeyes football legend) Woody Hayes win two titles” (Neale was also physical fitness instructor that helped the Buckeye football team) and also taught beginners hockey to several OSU football players, including Jack Tatum, later an all-pro Safety with the Oakland Raiders. When the MCHA folded in 1971, OSU joined a new league, the CCHA which has been founded that same year as a collection of fledgling hockey programs that would not become eligible to send a team to the NCAA tourney until 1977. In 1971, under coach Dave Chambers, the Buckeyes finished 24-5 and won the regular season CCHA championship, and conference tournament championship, but was not eligible for NCAA tourney play due to the league’s youth and composition. Former Buckeye Jerry Welsh took over the team as coach in 1975, and would hold the job for nearly 20 years without an NCAA tournament appearance, with a career record of 328-381-56. Current coach John Markell took control of the hockey Buckeyes when Coach Welsh retired and has been there ever since, with a winning record and over 200 victories, but more importantly the Buckeyes have gathered 5 NCAA tournament appearances, and one Frozen four appearance in 1998, when the Buckeyes fell to Boston College in Overtime, 4-3 in Boston. In the 2003-04 season, the Buckeyes found themselves on the top of the CCHA hill for the first time since the 1971-72 season, as the Buckeyes defeated the Michigan Wolverines in the CCHA Tournament final, but the Bucks fell to Wisconsin 1-0 in the NCAA East regional. 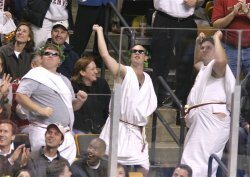 Since the completion of the Value City Arena, the Buckeyes have had excellent facilities that have helped in recruiting, but OSU hockey in the football and basketball-mad city of Columbus has had a hard time generating consistent fan support as it has at other large Big 10 universities. The Ohio State University (OSU) was founded in 1870 as a land-grant university under the name of the Ohio Agricultural and Mechanical College. The school was originally situated within a farming community located on the northern edge of Columbus in Central Ohio. While some interests in the state had hoped that the new university would focus on matriculating students of various agricultural and mechanical disciplines, Governor (and later US President) Rutherford B. Hayes foresaw a more classic, comprehensive university and manipulated both the university's location and its initial board of trustees towards that end. Later that year, the university welcomed its first class of twenty-four students. 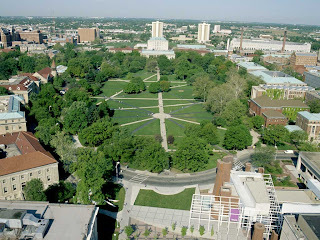 In 1878, and in light of its expanded focus, the college permanently changed its name to the now-familiar "The Ohio State University"
Today, OSU is huge – it is currently the largest single-campus university in the United States with more than 52,000 students on campus, and over 60,000 system wide. For comparison, the entire University of Denver undergraduate student population (4900) is smaller than the freshman class at OSU (6100). Despite improving academic programs, OSU is still probably best known for its enormous varsity sports program driven by its famous football program, with nearly 40 varsity sports and an athletic budget of over $100 million, more than 5 times the athletic budget of the University of Denver Football at OSU generates more than $60 million and returns a profit of nearly $30 million on its own, which allows OSU to fund nearly 40 sports and still have millions left over in profit to plow back into the school. Columbus is the capital and the largest city of the U.S. state of Ohio with a city population of 711,470 in the 2000 census, and metropolitan area population of 1,754,337. Located near the geographic center of the state, Columbus is the county seat of Franklin County, although parts of the city also extend into Delaware and Fairfield counties. Named for explorer Christopher Columbus, the city was founded in 1812 at the confluence of the Scioto and Olentangy rivers, and assumed the functions of state capital in 1816. The city has a diverse economy based on education, insurance, healthcare, retail, and technology. It is probably best known as the headquarters for companies such as Wendy’s, Nationwide Insurance and The Limited. 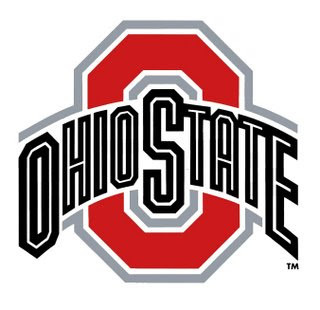 According to OSU, the use of the term Buckeyes to refer to Ohio State University sports teams derives from the even wider use of the term to refer to all residents of the State of Ohio. The university's Athletic Council officially adopted the term in 1950, but it had been in common use for many years before—certainly it was firmly established by 1920, and most records indicate that it had probably been used with some frequency to refer to Ohio State and its athletic teams since before the turn of the century. As with many such terms that seem to have evolved rather than been decreed, the history of "buckeye" is a bit fuzzy. The buckeye (aesculus glabra) is a tree, native to Ohio and particularly prevalent in the Ohio River Valley, whose shiny dark brown nuts with lighter tan patches resemble the eye of a deer. Settlers who crossed the Alleghenies found it to be the only unfamiliar tree in the forest. Perhaps its uniqueness contributed to its popularity because it had few other attractions. Pioneers carved the soft buckeye wood into troughs, platters, and even cradles. Before the days of plastic, buckeye wood was often used to fashion artificial limbs. The nuts, although inedible, are attractive and folk wisdom had it that carrying one in a pocket brings good luck and wards off rheumatism. However, in general, the trees and their nuts are of little practical use: the wood does not burn well, the bark has an unpleasant odor, and the bitter nut meat is mildly toxic. It was the presidential election of 1840, though, that put the term permanently in the vocabulary. William Henry Harrison, who had traded his Virginia-born aristocratic background for a more populist image as a war hero and frontiersman living on the banks of the Ohio River just west of Cincinnati, adopted the buckeye tree and buckeye nuts as campaign symbols. At the Whig convention, Harrison delegates carried buckeye canes, decorated with strings of buckeye beads. The buckeye nut was a precursor to today's campaign buttons. The buckeye became indelibly linked with Ohio. The Ohio buckeye is one of 13 recognized members of the genus Aesculus, seven native to North America, one to Europe (the horse chestnut) and five to Asia. The Ohio buckeye's five-fingered leaflet, along with the nut, are sometimes used as symbols for The Ohio State University and are incorporated in its Alumni Association logo. Buckeye leaf decals are awarded to Ohio State football players for outstanding efforts on the field; players with many buckeye leaves on their helmets are indeed honored. It is rare for an athletic team to be named after a tree; but the Buckeye name is so ingrained in the history and lore of the state and the university that few stop to consider how unusual it is. In 1965 Brutus Buckeye hit the scene when student Ray Bourhis, along with other members of the student organization Ohio Staters Inc., convinced the OSU athletic council of the idea of a Buckeye as Ohio State’s live mascot. At the time, other schools used animals for their mascots and actually had the animals present at the games. Bourhis thought the only animal fitting for Ohio was the buck deer, but bringing an actual buck to games would have been virtually impossible. 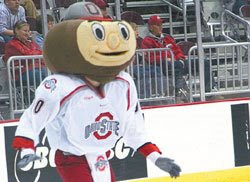 The buckeye was later named Brutus in an all-campus naming contest and began his career as a large fiber glass shell which weighed forty pounds. Since then, Brutus has gone through several updates, and today is a much more lightweight and active part of Ohio State sporting and spirit events. Ohio State's official school colors since 1878, Scarlet and Gray were chosen by a group of three students in a lecture room in University Hall because "it was a pleasing combination...and had not been adopted by any other college," noted selection committee member Alice Townshend Wing. In 1915, OSU student William A. Dougherty, Jr., set out to write the fight song for his alma mater. Introduced at a pep rally for the 1915 Illinois OSU football game, Fight the Team Across the Field made its Ohio Field debut at the same game. Though the lyrics are geared to the football field, it has become a rallying song for all Buckeye teams. While it has been arranged in many different ways and used for many purposes, its most popular appearance is at Buckeye football games. The signature formation of the Ohio State Marching Band performed before, during halftime or after home football games but also has been presented in a reduced version on the ice for hockey games. Actually first performed by the rival University of Michigan Band in 1932, the OSU band perfected the formation in the mind 1930s. Each time the formation drill is performed, a different fourth-or fifth-year sousaphone player has the privilege of standing as the dot in the "i" of "Ohio." At exactly 16 measures from the end of an old French military March "Le Regiment," the drum major struts out toward the top of the "i," with a senior sousaphone player high-stepping a couple of paces behind. As the crowd's cheering crescendos, the drum major stops and dramatically points to the spot, and the sousaphone player assumes the post of honor, doffs his or her hat and bows deeply to both sides of the stadium or arena. · Woody Hayes, Ohio State football coach and educator, M.A. OSU has had a checkered start to the season, and that’s not at all surprising for such a young team, which played only two upperclassmen last week. Coach Markell is hoping for a “Top 6” finish in the CCHA, but the Buckeyes are considered by most to be a little too young at this point to challenge the top teams in the CCHA this season. With frosh Zac Dalpe. 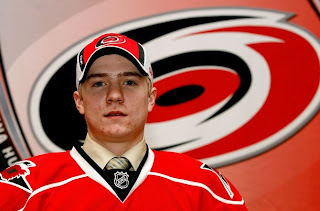 A second round draft pick of the Carolina Hurricanes, breaking out as CCHA Rookie of the Week last week, he is likely the key to the Bucks’ offensive success this weekend, but realistically, OSU needs a more consistent goaltending performance to have a chance at victory this weekend. The Pioneers, on the other hand, are coming into the homecoming series with confidence at 3-0, scoring progressively more goals (5-6-7) in their three games, all against ranked teams. On paper, it looks as though Denver should be able to get the sweep, and I think this is the likely outcome. That said, Denver needs to get some more focus out of goalie Marc Cheverie, who has been adequate but inconsistent to date. The Pioneers also need to be wary of a “trap” weekend, with arch rival Colorado College on the docket next week. Prediction: Sweep. Denver 4, OSU 1 on Friday, Denver 3 OSU 2 on Saturday. You're not doing so well on your predictions this season.